Hey friends! I've been sharing tours of the new farm house (both here on the blog and over on Instagram), but most of those have been tours of the house empty, before we moved in. I figured it was high time to photograph the house now that we've been living in it for almost four months! So let's look around! I filled our glass front cabinets with our daily dishes, which are a sweet blue and white porcelain dinner set you can find here. We got them (almost 9!) years ago at our wedding and I still love them every day. And now I get to look at them! I also added a few cutting boards, a banana stand (looks like someone needs to go grocery shopping...), plants, cookbooks and our countertop compost bin. A lot of you have asked me about that bin, I plan to do a blog post with details and my review soon (spoiler: I love it)! Over on the other side of this wall of cabinets, we made a little coffee station. We've got our toaster and my new coffee maker set up here. It's like the go-to breakfast spot as we're headed out the door (the mudroom is behind this wall so it really is a walk-through as we head out the door!). Back to the opposite end of the cabinet wall, you can see a peek of our pantry door (behind the empty banana stand! Someone buy me some bananas already!). The pantry basically is a little room which runs behind the counter and stove area. On the other side of the pantry, it opens up into our keeping room. And this is the view of the kitchen you have from the open concept living room. All the heart eyes. 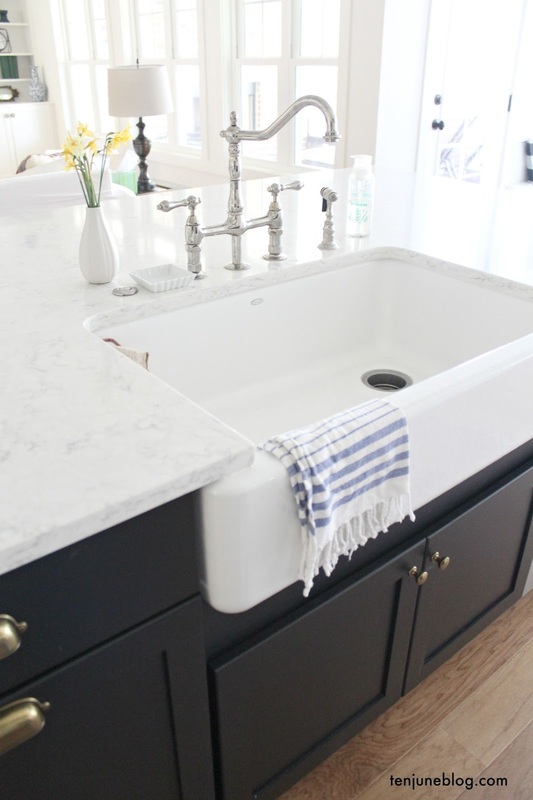 Then, of course, you have our big, beautiful island with our big, beautiful farmhouse sink. I still can't believe I get to wash dishes in here every day! This looks out to our living room and our covered porch. To the right of the island is our built in breakfast nook. Finally, can we talk about the custom vent hood? Man, I researched and researched and researched the heck out of this vent hood. I feel like it deserves it's own post? The short version is that I designed it and our carpenter built it. 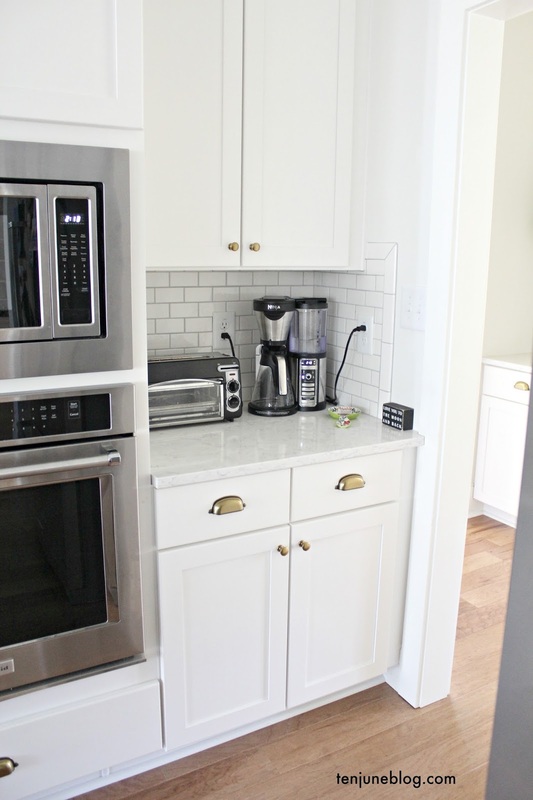 It's basically a streamlined, modern vent hood cover with shiplap. Super technical description, ha. And a cute little wood accent piece. Don't forget that little guy, I think that wood accent makes the hood. Let me know if you have questions on the vent hood and I'll do a separate post! So there you have it, my dream kitchen come to life. It feels so great that it's all ours and, truly, it feels like home. 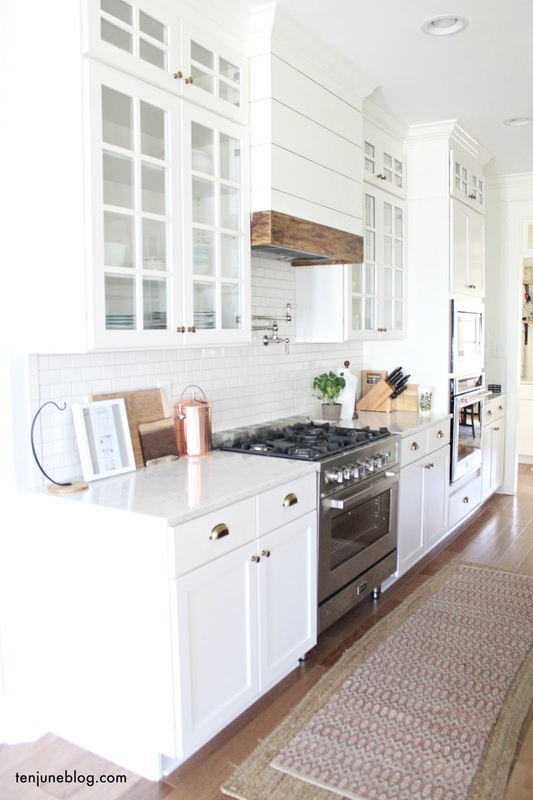 We've hosted many friends and family, cooked many family dinners and had many great moments in this kitchen already. I look forward to years more ahead! 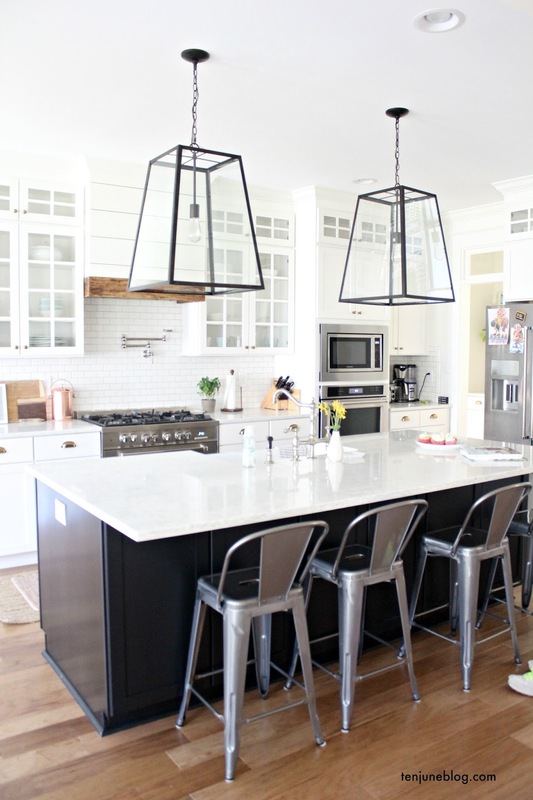 For a full list of sources on things like counters, tile, lighting and more, check out this post. 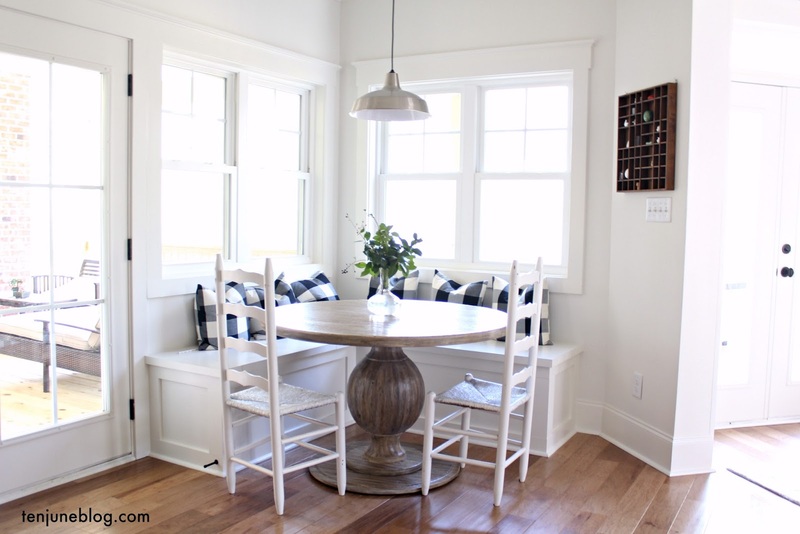 So warm and inviting...love seeing it all styled!! I want to see the family room next! Love it! and the first thing I noticed was the wood accent on the hood. 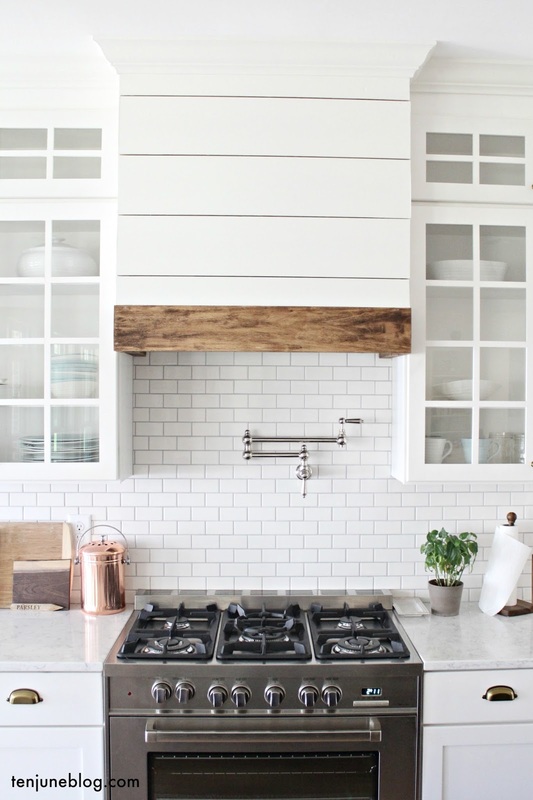 The natural wood texture is exactly what the white farmhouse kitchen space needs, it's perfect! Yay, I'm so glad you shared what it looks like lived in :) I love it! 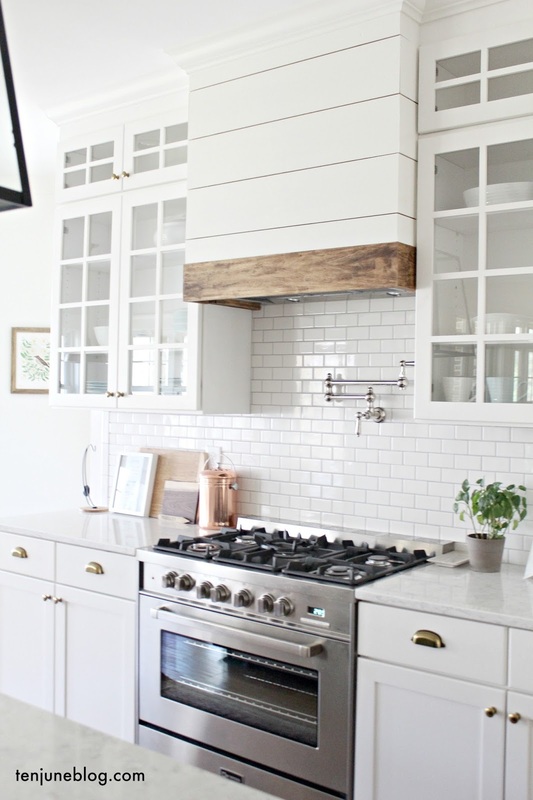 your kitchen turned out so beautifully! what a great space for your family! GORGEOUS! 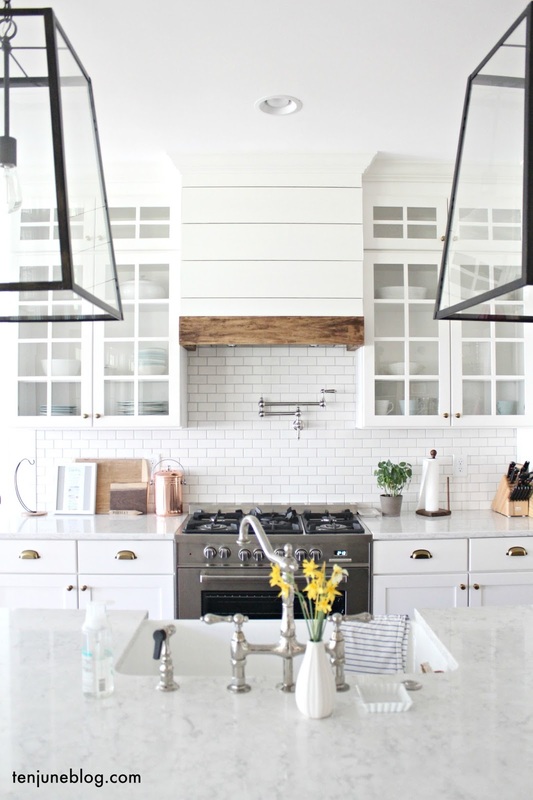 What's the source (and type) for countertops? THANKS!